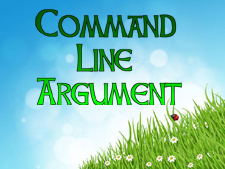 What is Command Line Argument in C#? What is the functionality of command line argument? How to use command line argument in C# programming? We all know, that we can pass the parameter to a function as an argument but what about Main(string args) method? Can parameters be passed to Main() method in C#? Yes, parameter(s) can be passed to a Main() method in C# and it is called command line argument. Main() method is where program stars execution. The main method doesn’t accept parameter from any method. It accepts parameter through the command line. It is an array type parameter that can accept n number of parameters at runtime. In Main(string args), args is a string type of array that can hold numerous parameter. To understand command line argument in C#, consider the following command line example. (i) Set current path, where your program is saved. Setting environment for using Microsoft Visual Studio 2008 x86 tools. Copyright <C> Microsoft Corporation. All rights reserved. In the preceding example, we passed two parameters STEVEN CLARK as command line argument to the main method. In runtime, Main() method accepted both parameters and holds it to the args variable that is string type array. Then both values are accessed with the index position of array. In this chapter you learned about command line argument in C#. You also learned how to use it in programming. In next chapter there are some programmings examples are given for you.